Tie off white. Sew in loose ends. For the outline, use black thread. Hook into first green chain, and sc all around the outside of the figure. 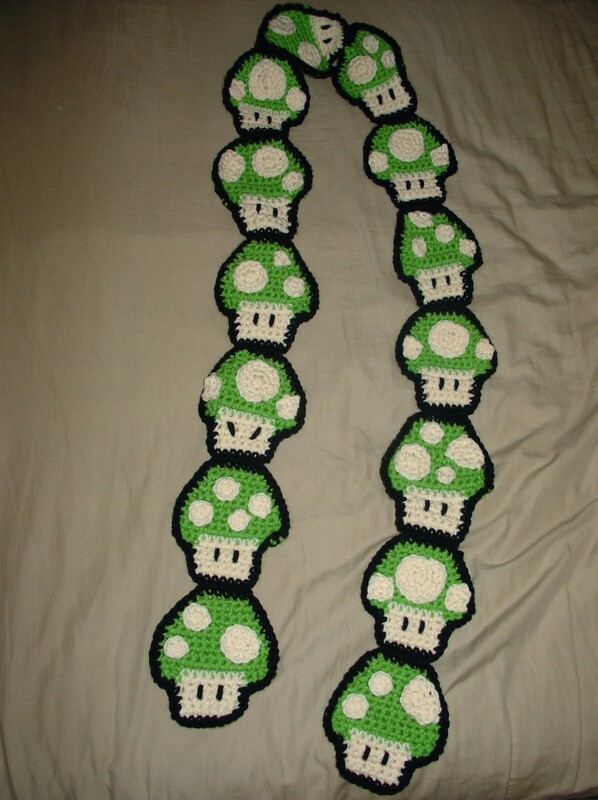 When you come back to the first stitch, slip stitch, and leave a 12 inch tail that you’ll use to sew the mushrooms together later. For the eyes, use black thread. Cut off a length of thread about 5 inches. Insert into the white section where you want the top of the eye to be, and sew through two rows down. Do this twice. Tie off on the side facing away from viewer. For the spots, use white thread. These instructions are for the main mushroom with one big spot and two smaller side ones. But you can switch up the appearance of the spots to give the scarf some variety. Row 1: Make “magic ring” (http://www.crochetme.com/forums/t/28917.aspx). 5 sc into ring. Slip stitch and tie off, leaving a 12 inch tail for sewing. Make 14 mushrooms total. Using the tail from the black outline, sew the top of one mushroom to the bottom of another. Make 2 pieces of 7 mushrooms each. Then sew the tops of the top mushroom on each piece to each other.